This year’s Crawley Irish Festival on Sunday 26th August has got the X Factor. 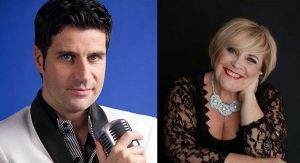 John McNicholl on tour from Derry and no stranger to the Irish Festival Circuit headlines a fabulous line up of musical talent from across Britain and Ireland from modern and traditional Irish music and open dance competitions. After some fantastic performances in the past John is back by public and popular demand and really looking forward to Festival Day on Sunday 26th August. He is joined by X-Factor semi-finalist Mary Byrne making her debut at Crawley . Although she was pipped for a place in the final in 2010, she won the hearts of millions with her big, warm personality and powerhouse voice. She has since gone from strength to strength with performing for Her Majesty Queen Elizabeth II on her historic State Visit to Ireland and has shared the stage with Neil Diamond. The Festival now in its 23rd Year and recognised as the only Irish Festival of its type in Britain attracts fantastic crowds from across the South East of the UK, has built a reputation as a great family day out over the August Bank holiday weekend. All in all its about showcasing Irish Culture with the remit also to encourage Crawley’s diverse and vibrant community to participate in a greater understanding of that culture. The idea of the festival is to bring cultures and communities together through participation and integration which can only be good for the town and it’s inhabitants. The Hawth Theatre once again plays host to the annual festival promising a fantastic day out for the whole family, and a chance to enjoy the very best and Irish entertainment and culture. It’s not to be missed – so be sure to save the date, 26th August. Every year the festival offers a wonderful array of entertainment, music, sport and dance – and this year is no exception! From humble beginnings, the festival has built up a strong following attracting over 6,000 people yearly. It has something for everybody of every age and background with music, song, dance and lots more and always adds to a great Bank Holiday treat with an Irish Buzz to it and IT’S ALL FREE. It features 3 different music areas catering from traditional to country to contemporary. The ‘Killoughery Group’ 7 hour MUSIC SESSION hosting Celtic Crunch and Strawdogs as they provide a musical backdrop where acts from across the festival are joined with local bands adding to a great mix of music throughout the day. Elsewhere, the Irish Dancing Arena features the famous Crawley Ceili with music from Tony Kearney and dancing displays from Crawley’s Irish Dance Schools. Martin Logan of Sky TV is recording a programme on the festival for his ‘Irish in the UK’ TV show to be broadcast a week later. Neil Munday of SuzyRadio103.4 and his team are broadcasting live all day. It all kicks off at 12 noon and runs for 7 hours at The Hawth Theatre in Central Crawley. The festival is a fantastic day out for the whole family and with a wide selection of food and refreshment stalls, it’s an ideal bank holiday treat!